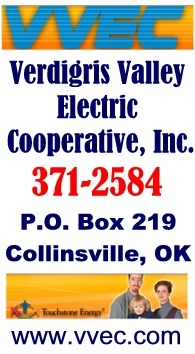 The Collinsville Board of Commissioners/Collinsville Municipal Authority Trustees will be hosting a reception for Melodie Bateman and Billie Reeder at 6:30 p.m. on Monday, May 3, 2010, at Collinsville City Hall located at 106 N. 12th, Collinsville, Oklahoma. No Collinsville City Commission/Collinsville Municipal Authority business is planned during this reception. 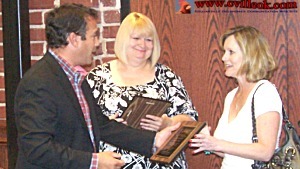 Mayor Stan Sallee presented plaques and thank you's to former City Commissioners Melodie Bateman and Billie Reeder. MONDAY MAY 3, 2010 AT 7:00 P.M.
A. Approval of April # 2 Payroll in the amount of $35,412.46. B. Approval of Claims in the amount of $12,989.65. C. Approval of Minutes of the April 19, 2010 Regular Meeting. D. Approval of Cemetery Deed for Wanda Youngblood or Gary Smith, 1 space. E. Approval of Payment Application # 2 in the amount of $150,130.10 on Park Project. 7. Discussion, consideration and possible action to adopt Ordinance No. 843, an Ordinance closing a portion of the Public Roadway Easement located at 1023 W. Center Street. -- approved, the new jail addition to the west side of the police station will be closer to the sidewalk than normally allowed without an exception approval. 9. Discussion, consideration and possible action to approve purchase of 2007 Chevrolet Silverado 1500 Pickup Truck in the amount of $14,800.00 for the Police Department. -- tabled, after a lengthy discussion with the commissioners in favor of the police having a 4-wheel drive vehicle for icy weather (based on limitations in previous winter conditions) but wanting to compare some other potential purchase options. The possibility of a special session in the next few days to reconsider was mentioned. Acting Police Chief Daniel Boggs discussed the benefits of this vehicle which is offered by Kent's Custom Cars and Trucks already fully equipped (except radio and decals) having been surplused by Washington County Sherrif's office recently. 11. Discussion, consideration and possible action on any matter discussed in Executive Session. -- no action taken following an approximate 1 hour closed session. * The city's new online bill pay system had already signed up about 50 users and about 30 had already used it over the weekend. * 8 blocks of asphalt applied today (Monday) as the Tulsa Co. crew continues work started April 26th. 2. Swearing in of New Trustees. 4. Consideration and possible action relating to a request for Trustee approval of the Consent Agenda. All matters listed under "Consent" are considered by the Authority Trustees to be routine and will be enacted by one motion. Any Trustee may, however, remove an item from the Consent Agenda by request. A motion to adopt the Consent Agenda is non-debatable. A. Approval of April # 2 Payroll in the amount of $22,689.04. B. Approval of Claims in the amount of $98,650.09.